Irma Stanton is a webmaster and fan of Elvis who contacted us requesting an interview, so we visited her website. We are a charitable club with one main subject which is to keep the music culture and the labor of Elvis alive; furthermore the establishment of an Elvis museum in Germany. There are still a lot of fans which still didn't find a place where they can meet other people of their same interest to exchange informations and where they can get involved in the public events in temporary history around the myth Elvis Presley. My motivation is to keep the music culture and the memory of Elvis alive, both as an artist and as a human being for all of our following generations. I do my best to help having an Elvis Presley Museum established in either Bad Nauheim or Friedberg. 1. What was it that got you hooked on Elvis? : The way he looked. And I am not talking about some pic from the 50ies; I first saw an article on him in Bravo Magazine that showed him in the 50ies and also though towards the later concerts. It touched and impressed me more than anything in life ever. Felt dragged on to him. And the things I read about him; after that I finally heard his voice and it stayed in my ear ever since that first moment; and then — after all this years- it has grown into something beyond compare, what I feel...yes, of course "hooked" is the right expression for it. He molded me, you could put it also that way. 2. 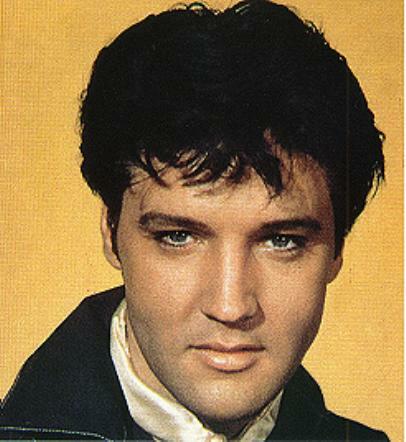 WHICH is your favourite Elvis Presley song or movie? And why is it your favourite? : Movie= Wild in the country, because it is a dead serious movie and Elvis plays his part fantastic and it is a movie that can fit right in at any time, even today it would be an interesting movie on TV saturday nite, per say... Song= of course I have a lot of "favorite" ones, but the one that is my absolutely favorite is "Fairytale", because I believe him, what he sings, and I feel (and felt) often the same, very often. 3. Which is your favourite SUIT that Elvis wore on stage? : Well, actually he looked good in all them things, even though noone else would have ever looked good in them. I personally liked the two piece suites (darkblue and white, both) a lot, he only wore them in `75 unfortunately; very cool was the Dragon Ornament, the peacock and the blue rainbow on white ground. 4. If Elvis were alive, what would you like to say to him or ask him? 5. Why do you think Elvis still attracts new fans every year, even long after his death? 6. Have you been to Graceland?...If so, would you like to share your experence or feelings on this site? : Still not; for it is the goal of my life to go there and I definitely do not want to go there as a "toury"- in a crowd, a group or as a clubmember; I save this part of my life for a very special day, and it keeps me going some times, when I am really bad off to have something that I still want to go to; because you must see: I have been around very much in my life, all over different places, to live at and everything, and I have still not been to the places I want to go to the most; Hawaii is also one of these places. But when I go there I want to really have my mind free and I want to absorb that emotion like a sponge. I booked 2 years ago, but unfortunately my mother was ill and died, so that I have to find a new "perfect" date for me. Definitely not around the 30 years of death aniverasy, though. You touched me there were no other was ever allowed to go You came and you just made me fit right in your mold. Before you, there was nothing Without you, there was nothing But with you is everything Nothing is perfect to me But you. Your mark stayed on my mind Lingered there, behind Without no pain No sorrow, just still. Waiting for me to find the spirit, the own soul of mine I guess it was God` s will. And it came all back above What I needed, what I love When the flesh turns to blood of the spirit of the one you love. Spiritual love, so much higher Because of its eternal flame burning thru the soul In my heart, in my body, never goes dim And I feel closer and closer to my goal. The end of my peculiar travel I feel in sight And I think the road I` m taking is right So I see the light with you on my side Because love is light And light is love And love is YOU. 8.Would you like to tell us a little bit more about yourself to share on your own Elvis Presley Fan page? : I do my best to help having an Elvis Presley Museum established in either Bad Nauheim or Friedberg. 9. How are the plans for the Elvis Presley Mueum coming along? Since the Ray Barracks will be left by the US Service in summer 2007 we have hopes flying high to get a piece of that area; but it is still very insecure and we hope for a lot of fans to help preventing that the area will be lost to the German economy who probably brings everything down to set up a housing area or some supermarket instead. A campaign will be up soon, we hope. Besides that we have tried several things allready, but without success in finding an investor, which you — of course- need for a project like this. But since it is definitely the main purpose of our club we will get it somehow. I am optimistic. 10. How can Elvis Presley Fans find your Website? In searching in google for my name and Elvis`name, per say...or thru links on other websites. 11. Did you ever met Elvis personally, or see him in concert? Unfortunalety not; I was still too young to make a travel or see a concert; I was — atually- 13 years old when he passed away so untimely. Thank you Irma for sharing your devotion for the king with us. Your site is very interesting with great information` We wish you all the best with the Elvis Presley Museum in Germany. Wir sind eine Arbeits — und Interessengemeinschaft, deren Zielsetzung es ist, die Kultur, den Einfluss, den er darauf nahm und das musikalische Werk von Elvis Presley (08.01.1935 — 16.08.1977) Generationen `bergreifend zu erhalten, auch hier in Deutschland wo er seinen Wehrdienst absolvierte (1958 ` 1960) und mit seiner Familie wohnte. Deshalb haben wir zum 30. Todestag und in den Wochen um diesen Termin herum eine Ausstellung zusammengetragen, die zun`chst als tempor`re Ausstellung in Friedberg in Hessen, wo Elvis Presleys Einheit ihren Standort hatte, pr`sentiert wird. F`r die Umsetzung dieses Vorhabens und der damit verbundenen `ffentlichkeitsarbeit sind wir auf Unterst`tzung seitens Einrichtungen wie die Ihre angewiesen. Es geht uns darum, eine von Qualit`t und Niveau gepr`gte Ausstellung zu zeigen, um die Individualit`t des K`nstlers des 20. Jahrhunderts zu unterstreichen, keine wie schon oft gesehene Anh`ufung von Dubletten und Imitationen. A call to all the Elvis World: Let us try to be able to keep Ray Barracks in Friedberg Hessen Germany where Elvis served the Army overseas to Elvis History and let it become a museum in memory of Elvis. Sign in on my list, send me an Email or an Open Letter to my Email Account. We`ll try everything to keep the buildings from being torn down or waisted on something else but Elvis`memory. Member of the Board of the Elvis Fan Club Bad Nauheim Friedberg e.V. For years, there have been rumours about plans to tear down the army base Ray Barracks in Germany. Visitors may remember that `filming or pictures` were strictly forbidden. Elvis fans were not welcome ` at all. But times do change. For the first time in years, the Barracks will be open to the public` with a 4 week Elvis expo. There`s no charge, and as a bonus on weekends, a few `small` events are scheduled at the former army base: music nights and get-togethers with Harley and Caddillac clubs, a Jazz and Oldie evening, a Vespa reunion and more. We have an expo on Elvis in Ray Barracks in Friedberg; Germany, where he served the army. It`ll begin 16th of august and end 17th of september. Description of site contents: This site contains Elvis Presley biography information, history on Elvis Presley life story, Elvis Presley pictures and photos, Elvis Presley song lyrics, Elvis Presley movie resources, free e-books and articles listed for your convenient search in subjects of: Elvis Presley biography pictures and photos, Elvis Presley song lyrics, Elvis Presley movie resources, Elvis Presley childhood, Elvis Presley Band members biography, Elvis Presley biography girlfriends, Elvis Presley spiritual medium stories, Elvis Presley Memphis mafia stories, Elvis Presley biography diary quotes, Elvis Presley biography movie and music details in relation to the Elvis Presley autobiography and interviews of friends and family members for the Elvis Presley biography website written by a fan for his fans.